I am combining my interest in gardening with my newfound interest in home brewing on a new website BeerAndGarden.com. I have copied all the posts from here over to that site and all new posts will be added there. This older version of the site will no longer be maintained. I noticed recently that there are ants all over one of my raised beds – they are all over the lettuce and other greens. On closer inspection I see that the leaves are also covered in aphids. The little blighters are running an aphid dairy farm in my garden! That can’t be good for the crops so I have to get rid of them. 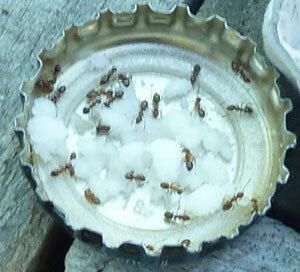 After a quick look on the internet I found one of the most widely suggested ideas for getting rid of ants is with borax, which is a white powdered acid (boric acid) that kills the ants by dehydrating them and drying them out. Here in New Zealand I was able to find borax for sale at my local Binn Inn. Generally it appears you need to mix it with something that makes it more attractive as a food to the ants. So I started with an easy recipe – just mix it with some powdered sugar (has a similar consistency as the borax powder). I set some out for them in a beer bottle cap and dusted a little bit directly on their trail. They seemed to be avoiding it at first but when I checked this morning, they had cleaned up all the loose stuff from the trail and they were all over the bottle cap. So this morning I laid out some more second helpings for them. My plan of attack is to get rid of the ants first and then tackle the aphids. The worm farm is going strong for over 4 months now. It produces about 1.5 litres of worm juice per week. I’ve been putting this on my veggie garden and look forward to seeing some good results this year. My tomato plants are looking strong but probably still a month away from producing fruit. I’ve applied some worm juice to everything I’m growing – tomatoes, zucchini, cabbage, lettuce, broccoli, spinach, bok choy, silver beet, herbs, carrots, turnips, potatoes, pumpkins and even to new apple and citrus trees. I reckon it can’t hurt. Maybe next year it would be interesting to experiment by applying to some plants and not to others to see if it makes much difference. The worm juice is collected in a one litre container placed under the drain home of the bath tub. Some worms do make their way out into the container (as noted by Rodney of justaddworms.com) but I just strain them out and throw them back into the worm farm. I then add the litre or so of worm juice to a watering can and dilute by filling up the rest of the can with water and put it on a part of the garden. My worm farm has been going for about 2 months now and seems to be working well, producing a decent amount of worm juice. However some rain seems to be getting in as a lot of liquid is coming out after heavy rain and it looks diluted. The duct tape I used to hold the weed mat in place is coming loose but the contents are holding it in place so it’s not a problem at this point. There seems to have been an explosion in the worm population which is a good sign – they’re all over the place now when I open up the lid – on top of the cardboard layer, on the sides, on the lid, everywhere. And as Rodney commented, there are a few of them getting into the worm juice but it’s just a few so it doesn’t seem to be a problem at this point.